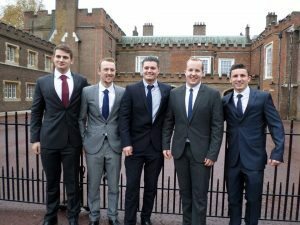 A record 14 students from St Edmund’s College received their Gold Duke of Edinburgh Award from HRH The Earl of Wessex at St James’s Palace on Monday 17th November. The students were: Pierce Gribben, Luke Fakes, Abigail Neal, Rhys Hunt, Andrew Tomlinson, Jacob Larkin-Collins, Connor Bolton, James Simon-Lewis, Robert Hartley, Savva Spanos, Scott Hayes, Max Nicholas, Hannah James, Lewis Norman. The Gold Award Presentation is a celebration and recognition of students’ achievements in completing their Gold DofE Award and a fitting culmination to mark the hard work, determination and perseverance required to achieve this. Elizabeth Cobb, Director of Activities, said: “This is a tremendous achievement for these students who have worked so hard to be one of only a small percentage nationally to be awarded their Gold Award. The Duke of Edinburgh Award fits well with the ethos of St Edmund’s where we ensure that our students have a strong academic education that is complimented by an excellent activities programme which encourages students to develop life skills that are so important for their futures ahead”. Students are able to start the Duke of Edinburgh programme in year 10 and we currently have 48 Sixth Form students completing their Gold Award. This year Bronze, Silver and Gold expeditions will take place in New Forest, Peak District, the Shropshire Hills, Black Mountains, Brecon Beacons, River Thames, River Lea, River Ouse, River Nene, River Severn, River Wye and last year a group of students were able to complete their assessed Gold walking expedition in Thailand on a school visit.